Oh my, the other Hazzard County girls are going to be so surprised when they see I have joined in this months challenge. Let's say I killed two birds with one stone. 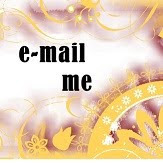 Saturday I went to a Megameeting (for demonstrators) in Burlington with Kathy and we had a great time. 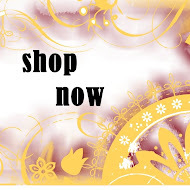 It has been a few months since I joined in any swaps, so when I saw Jacqueline Cameron was hosting a Sale-A-Bration Mini and an Occasions Mini swap I joined both. My cupcake has the most detail but still came together quickly. 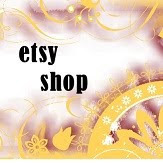 I punched out a piece of Real Red cardstock using the 2 3/8" Scallop Circle punch, I cut out a Baja Breeze circle (2 1/4") using the Circle Scissor Plus and then a Whisper White Circle (2") using the Circle Scissor plus. I layered these three together. 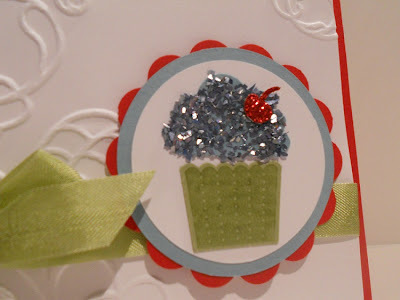 Next I punched out my cupcake top from Baja Breeze cardstock using the Create-a-Cupcake punch. I covered the piece in Tombow Multipurpose Glue and covered with Baja Breeze Glass Glitter (soooo pretty). The cupcake bottom was made by inked up (using a marker) in Pear Pizzaz ink from the Create-a-Cupcake stamp set and stamped on Pear Pizzaz cardstock. I used the punch to then punch it out. I glued this to the White cardstock circle. I also added Tombow double sided adhesive to my glittery cupcake top and added that to the white circle as well. Then using the oh so bold Red Glitter paper from the Occasions Mini I punched out my cherry and used a glue dot to hold that in place. Next I ran a piece of Whisper White cardstock through the Big Shot using the Elegant Lines embossing folder. I wrapped Pear Pizzaz seam binding (also from the Occasions Mini) around and tied in a bow. Wow is this stuff shimmery and light, you can barely feel it between your fingers. I can't believe how gorgeous it is though and can't wait to order more. I added my White embossed layer to my 4 1/4" x 5 1/2" Real Red card base and finally popped up my layers of circles and cupcake to the front of my card. 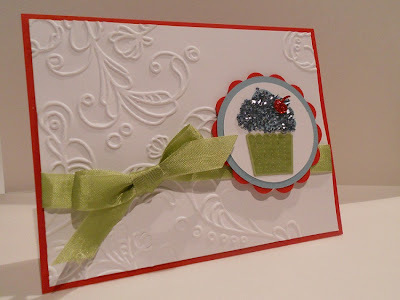 I love the bold bright colours of this card and how yummy that cupcake is.